There is something magical and beautiful about vintage styling when it comes to jewellery. Vintage diamond eternity rings don’t appear that often in jewellery collections. As a result, we regularly create bespoke examples—crafted specifically for our clients. Recently, however, we introduced two brand new vintage diamond eternity rings into our collection. 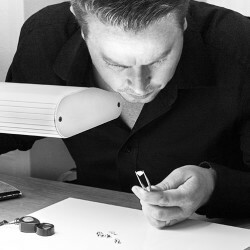 Please note that if you are unable to visit us to view our designs, we offer a ring sample loan service, available to UK and overseas buyers to try before you buy. But what is Milgrain? Milgrain is a distinctive detail that features in many vintage designs. Small beads of raised metal follow along edges creating a uniform pattern on each side of the ring. Rings featuring a milgrain edge give jewellery less of a reflective finish, offering more subtle qualities. In contrast, the lower part of the band features a mirror polished finish. Grain settings work well for any vintage styled eternity rings. White diamonds grain set into white metal yielded textures reminiscent of antique jewellery creations. Textures of soft crepe de chine and pin-tucked lace. 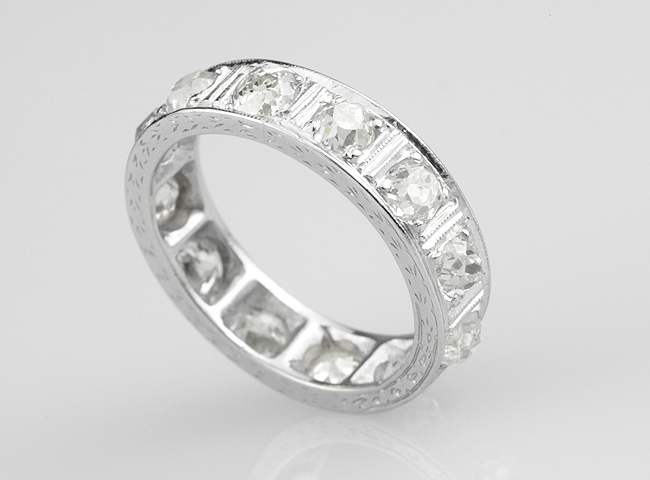 Some genuine antique eternity rings feature old-cut diamonds around the band. Furthermore, most modern eternity rings, set with diamonds use modern round brilliant cut diamonds with 57 facets. Decadent antique eternity rings from the late 19th Century tend to be Platinum. Platinum remains the most luxurious of precious metals. It wears over time to achieve a natural patina seen as desirable for genuine vintage diamond rings. The grey-white appearance of Platinum, adds a luxurious feel to an eternity ring. 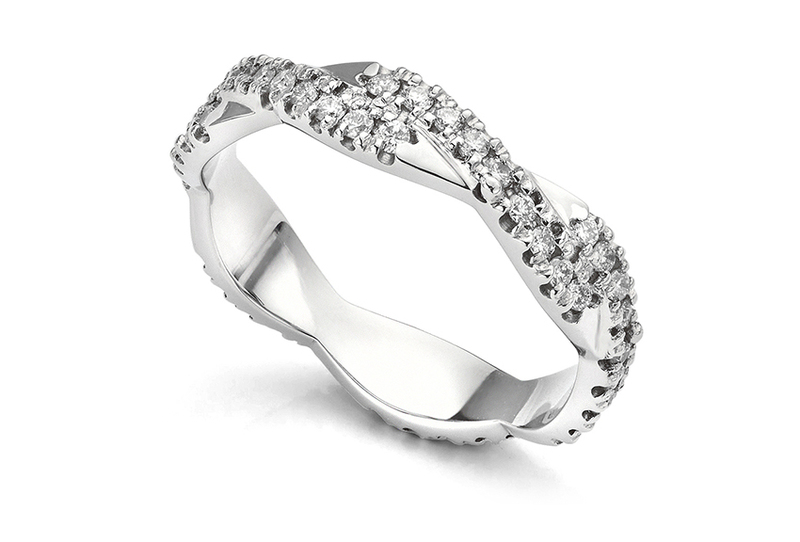 As a result, Platinum is very popular for eternity rings. In addition, Platinum is a rigid metal, suitable for setting diamonds. Furthermore, it has hypo-allergenic properties, perfect for sensitive skin. Today, vintage styled eternity rings come in most precious metals. These include 950 Platinum, 18ct White Gold, 18ct Yellow Gold and 18ct Rose Gold. In addition, Fairtrade Gold provides a 100% ethical option. A key feature of vintage diamond eternity rings included the imitation of antique lace. 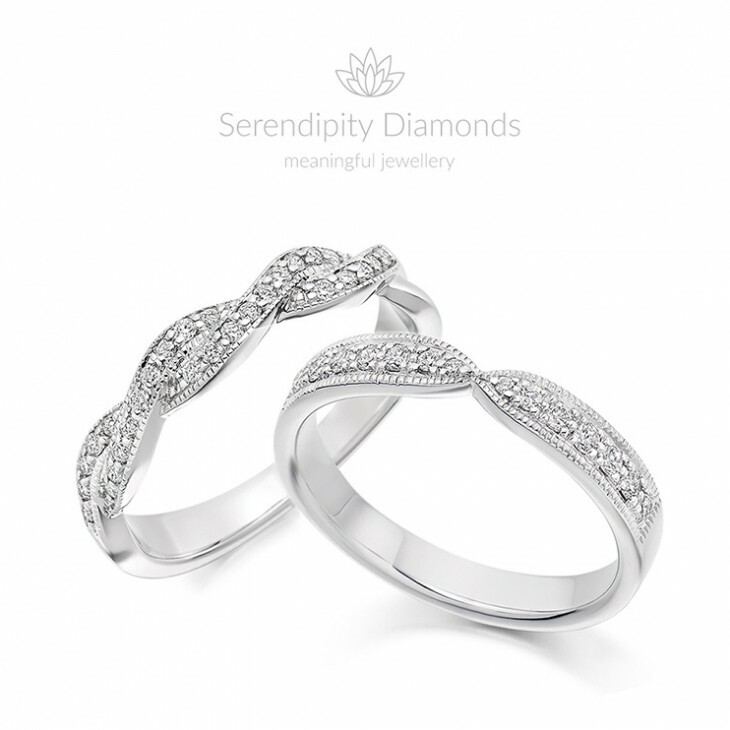 For example, woven bands, ribbon twists and platted ring designs combine with rows of small diamonds. The necessity for a ring to fit around a setting gives jewellers the opportunity to deviate from a straight eternity band. As a result, interesting shaped eternity rings exist, working around awkward settings. How long does it take to make a vintage diamond eternity ring? Most vintage styled diamond eternity rings take around 5 weeks to create. The above designs are readily available (non-bespoke) vintage eternity ring styles. Both take around 4 weeks to complete. We design, craft, set and finish your eternity ring during this timescale. First stages include an email or phone discussion (or appointment in our showroom.) Next, we move to a detailed quotation before any work commences. Contact us for more help and guidance on this unique service.